Although both being visual media, printed texts and photographs are generally perceived as being very different, if not opposed, in character. Print is seen as a standardized and easily reproducible form of writing; writing, in turn, is considered as a convention-based durable translation of speech, of thoughts and observations into an abstract visual code, most often used as a subjective form of expression. Photography, on the other hand, is understood as a physical imprint of light, as a perceptually accessible trace of the scene it depicts, and is therefore seen, at least to a certain extent, as a medium of realism, truth and objectivity. However, both media appear together so often that writing and photography seem to complement each other. Photographic pictures may act as an illustration of what is written or writing may act as an ›anchor‹ (Barthes) that helps to ›read‹ the trace in the photograph. Especially the presumed fragmentary status of photography as a cut from a spatial and temporal continuum seems to call for the companionship of writing again and again ‒ particularly on the pages of print media: in books, magazines, catalogues, etc. On the printed page, the letterpress is not only a site of verbal discourse, but, by connecting pictures with a certain arrangement of the typeface, the layout may confer pictorial qualities to writing. This complex relationship and its range of phenomena renders scientific research on this topic not only appealing, but also extremely challenging. The workshop encourages an interdisciplinary exchange in order to discuss possible answers to the primary question how this relationship can be addressed methodologically. The workshop will set forth the different methodologies, outlining both disciplinary and individual avenues of approach, and will thus show the foundations of the specific researcher’s thinking about this topic. The manifold inter- and multimedial phenomena that appear at the intersections of photography, writing and print find their place alongside the diversity of methods. Examples of these phenomena will be taken from photomontage, the photo-novel, advertising, the illustrated press, captions, photo albums, cinéroman and photocomics. 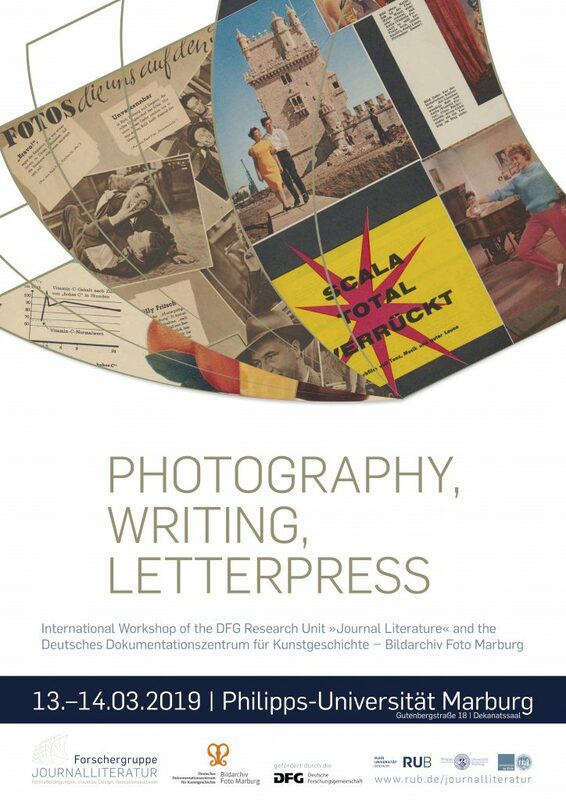 Der Workshop wird von der Forschergruppe Journalliteratur und dem DDK veranstaltet, versteht sich aber als offenes Diskussionsforum, das allen zeitschriftenaffinen Forscherinnen und Forschern offensteht. Da die Teilnehmerzahl begrenzt ist, wird allerdings um vorherige Anmeldung bis zum 10.03.2019 an Sabine Wirth (journale@staff.uni-marburg.de) gebeten. Nach der Registrierung per Email erhalten Sie zur Vorbereitung dann einen Text-Reader.